Local resident Tom Morgan-Jones is an award winning illustrator. I first met Tom a few years ago when he was visiting my friend and neighbour with whom he had co-created the board game ‘War On Terror’ (great fun to play, though I think my parents were a little taken aback when I bought it for them as a Christmas present!) and since then he has worked on numerous projects. His work can be seen in all manner of places and one of his most recent publications is ‘Mission: Explore Food’, which he both co-authored – along with other members of the Geography Collective – and illustrated. The book aims to change the way children think about food and teaches them everything from growing food and cooking it to eating and food waste. It’s a family book and includes over 150 ‘missions’ for children to complete. Tom has lived just off Mill Road for over fifteen years now and whilst doing his research for the book he spoke to local butchers Andrew Northrop’s. He tells me that they were extremely helpful and really helped the book to become what it is – so where better to get your copy than on Mill Road itself! ‘Mission: Explore Food’ written by The Geography Collective & illustrated by Tom Morgan-Jones. Hardback, available from Andrew Northrop’s (114 Mill Road, CB1 2BQ) priced £20. Also available to order online via the Guardian Bookshop. Celia Anderson is a writer and web designer who runs her own copywriting business in Devon, but her roots are firmly steeped in Cambridge and she has lived on Mill Road itself – in fact she describes herself as somewhat of a Mill Road fanatic (and I know she still misses the Black Cat Café!). I have known Celia for many years though have not seen her for a while – during which time she has had two children (where does the time go!). Combining her love of writing with her new-found experience of motherhood inspired her to start her blog – 2under2 – back in 2012. This has been hugely popular and so she has now published a digital book all about her experiences – ‘Two under two: coping with a baby and a toddler’. It’s a personal and empathetic guide to coping with a toddler and a newborn and has plenty of useful tips as well as interviews with other parents of two under two. ‘Two under two: coping with a baby and a toddler’ by Celia Anderson. Available for download on Amazon, priced £5.73. Joan Court is a local writer and campaigner with a passion for animal welfare. She lives in the Mill Road area and is a confirmed vegan and cat lover who is very much part of her local community. I first met Joan some time ago and she is one of the most active people I know (which considering her 93 years, puts many of us to shame!). Although much of her time is currently taken up with running campaigns for Animal Rights Cambridge (which she co-founded in the late 1970’s), she has had a varied career that has seen her work as a district midwife in wartime London, witness Indian independence, attend fasts with Mahatma Gandhi, pioneer birth control in Pakistan, retrain as a social worker and at the age of 86 become a crew member on the Farley Mowat (as part of Sea Shepherd) – as well as gaining a degree in social anthropology from New Hall (now Murray Edwards College) here in Cambridge and a masters degree in social work. Joan has recently published her third book – ‘Animals Betrayed’ – which has interviews with a number of animal rights activists and campaigners, and gives an insight into many of the issues that have affected animal welfare over the years. ‘Animals Betrayed’ by Joan Court. Paperback, published by Selene Press and priced £12.50 (+£2 p&p). Please phone (01223) 311828 to order your copy. Luckily you can get your hands on copies of all the above books without ever having to leave Mill Road – happy reading! I was really pleased to hear about the RSPCA Bookshop on Mill Road re-opening on Saturday – when I first saw the shop empty a couple of weeks ago, I had feared the worst, but it turned out they were just doing the place up! The RSPCA Bookshop on Mill Road, which re-opened on 11th August 2012. I popped in today to see how they’ve been getting on since the refurbishment, and was greeted with a very warm welcome. The shop is bright and airy with a new blue and white colour scheme and they have books on just about every subject imaginable (though the poetry and science fiction sections particularly caught my eye!). There’s also a growing collection of CD’s, DVD’s, videos and vinyl records; and you can even buy a cup of coffee to enjoy whilst browsing. It turns out they actually have more books than space at the moment, so if there’s something you’re after but can’t see it on the shelves, it is probably worth asking. They rely on donations of unwanted books from the public – in fact just this afternoon they had a number of fishing books donated, so if this is what you’re angling for then do pop down and see them. The bookshop is now one of only two bookshops on Mill Road and is a much needed resource in the area (especially since both Browne’s Bookshop and the Libra Aries shop have closed in the last few years). 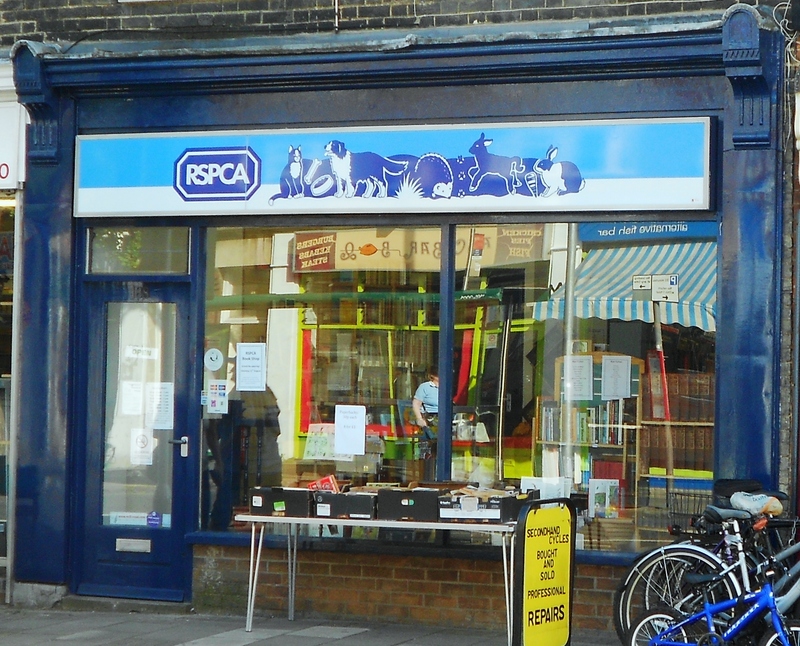 The shop is staffed by volunteers and the money raised goes to a very good cause – the work of the RSPCA focuses on animal rescue, welfare and cruelty prevention – so I for one am really pleased to see it open again and serving the community.